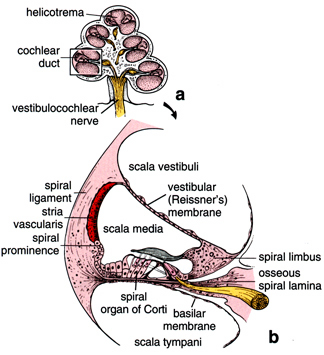 The helicotrema (from Greek ἕλιξ meaning coil and τρη̂μα meaning hole) is the part of the cochlear labyrinth where the scala tympani and the scala vestibuli meet. It is the main component of the cochlear apex. The hair cells near this area best detect low frequency sounds. ^ Behrbohm, Hans; Kaschke, Oliver; Nawka, Tadeus; Swift, Andrew (2009). Ear, Nose and Throat Diseases (3 ed.). New York: Thieme. p. 15. ISBN 9783136712030.